The dog days of summer are here but so too are some of the best races of the year. Performing well in these races requires both fitness and an ability to withstand the heat. Heat acclimatization in the weeks prior to an event is the most important step for beating the heat on race day.1 However, in addition to acclimatizing to the heat, there are a number of different strategies that can help you keep cool and improve performance on race day. When you are exercising, roughly 75 percent of the energy required for muscle contraction is lost as heat. Hot summer days make it difficult for the body to get rid of all this heat. As a result, your body temperature begins to increase which can lead to dizziness, headaches, nausea, and even brain damage. As you might guess, all of these symptoms can affect performance. Therefore, the key to maximizing performance in the summer (and what the strategies listed below attempt to achieve) is to limit the increase in body temperature. 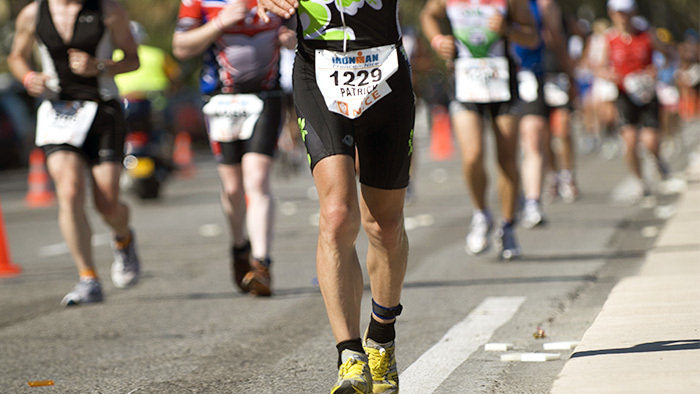 “Pre-cooling” is done to decrease body temperature prior to a race and has been shown to improve performance.2 Pre-cooling can be done in a variety of ways such as soaking in cool water, wearing a cooling vest, wearing iced clothing/towels, using fans to increase airflow, and drinking cold fluids like ice slushies. Some of these strategies are not practical at a race venue but others can be combined and when utilized together, can further improve race performance1. It is important to note that pre-cooling is not appropriate for every kind of race. For example, short events such as sprints are impaired with pre-cooling since your muscles need to be warm for optimal performance3. Additionally, pre-cooling does not always improve your body’s temperature regulation but can still improve performance due to psychological changes (i.e. lower perceived exertion)3. In addition to carrying oxygen to the working muscles, the body also uses blood (more specifically the plasma) to transfer heat to the extremities where it is dispersed to the environment more easily. In hot environments though, it is difficult to maintain plasma volume in part due to the increased sweat rate that results from heat acclimatization. Therefore, another race day strategy is to increase plasma volume pre-race. Like pre-cooling, hyperhydration has some potential limitations. Hyperhydration can increase blood pressure to unsafe levels and can lead to digestive issues. Furthermore, if utilizing hyperhydration, keep in mind that additional time is needed for the fluid to empty from your stomach, making this strategy less feasible for early morning race events. Although they typically get less press, there are other pre-race strategies which still deserve mention. The first and easiest is to avoid direct sun by staying in the shade. Seeking out areas with a breeze is also beneficial as airflow helps with dispersing body heat. Modifying your traditional warm-up can be another way to keep body temperature from increasing too much. This can be achieved by spending less time on the trainer, shortening hard efforts, and/or shortening the entire warmup. In hot environments, the brain will change your pacing strategy so that a critical body temperature (~40°C, ~104°F) is not exceeded6. Thus, while dependent on the race, pacing strategies should be modified in accordance with the heat to involve slower starting speeds and saving attacks until the final portions of the race. Of note, sticking to a slower pacing strategy can be difficult following some of the pre-cooling strategies described above as they can trick your mind into thinking the environment is cooler than it actually is6. Optimal performance therefore requires confidence in your pacing strategy so that the critical body temperature is not reached early in the race. Your ability to effectively regulate body temperature is influenced not only by your ability to stay hydrated as mentioned above, but also by the temperature of the beverage you are hydrating with. So while a cold beverage may be perceived as the most refreshing, you may consider keeping your hydration closer to room temperature, so that the body’s cooling mechanisms continue working to keep you cool. Placing pantyhose filled with ice on your back under your jersey is another great way to stay cool during a hot race. The ice feels great and as it melts, and the water aids in evaporative heat loss. Pouring water on yourself has a similar effect. Of course, environmental conditions need to be taken into account as humid environments will reduce evaporation, so pouring water on yourself can result in nothing but wet clothing. As we have all experienced, the heat can be a major limiter in achieving goal performances. However, utilizing the above strategies to stay cool can go a long way to improving performance and could even make racing in the heat one of your strengths. Needless to say, it is important to practice these strategies prior to race day as this will help you better maximize improvements and achieve goal performances.